Make Your Table Sparkle - Tips to achieve a great tablescape! Choosing a neutral palette with metallic elements will give you a simple but classic base to build your holiday design. Here are some tips to achieve a great look for your tablescape. For starters, create your tablescape on a complimentary runner or mirror. Spray branches with a metallic paint (silver or gold) and place them in a vase or on the table. This adds an unexpected dimension. Add feathers for an exotic flair! Candles and twinkle lights lend a magical ambiance. Fill clear vases with colored ornaments in assorted sizes to add a dramatic touch. Make your design personal by choosing items you have in your home such as candlestick holders, collectibles, wine goblets, etc., to add to your design. Bring your chandelier to light! 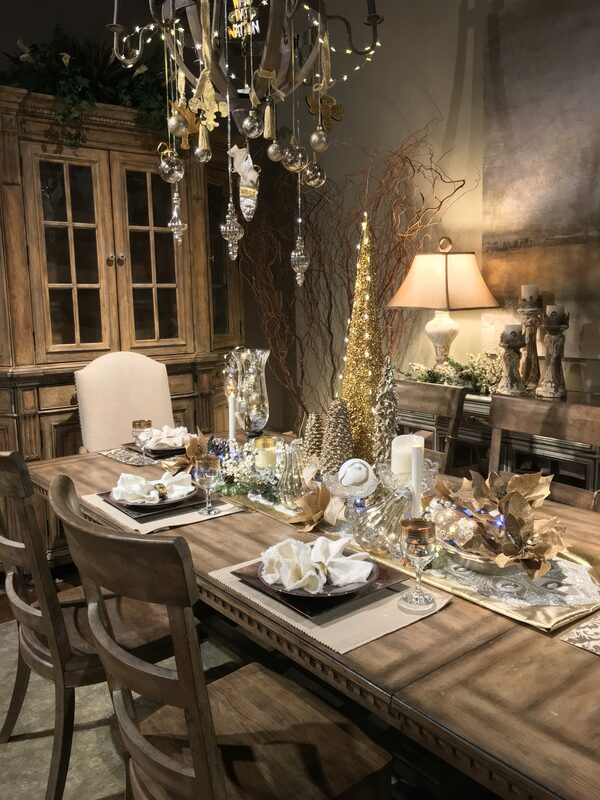 Complement your table design by draping ribbons from the chandelier in staggered lengths and adding textured ornaments. Comeaux is CEO and corporate designer for American Factory Direct Furniture Outlets. Previous article WHAT TO WEAR? Here’s the answer.